Tidewater Tuneup stats are listed below. The big thing I want to point out this time is the turnovers. We played 103 total points in 6 games and turned the disc over 124 times (1.20/pt). That's obviously more than once per point which is just way to high even for the somewhat windy conditions we faced. We have got to do a better job of keeping possession when we have it, the more turnovers we have the less chance we are going to win the game. Just to compare, in Fall Brawl we played 153 points in 8 games and turned the disc over 131 times (.86/pt). Congrats to Angel for being the only person without a turnover, Will, Alan, Adante for the most statistical improvement. If it rains use the indoor practice that has been listed previously. Take this week off from ultimate to rest and think about where you want the team to go and how you are a part of that. Try to get at least 1 if not 2 runs of a couple miles in during that time. Thank you to everyone who attended this years Tidewater Tuneup. We really appreciate you being part of the 23 teams who attended, making Tidewater Tuneup one of/if not the largest tournaments of the fall season this year. For all those who turned in the tournament evaluation thank you, we appreciate your compliments and your constructive criticism. We will work hard to improve on this weekend with our spring tournament and again next fall (stay tuned to the blog for more details). Congratulations to our Champions Pennsbury in the boys division and Allerdice in the girls division, both of whom went undefeated on the weekend. The winners of the Spirit Award are CHUF for the boys with a perfect score of 5 and YHB-Z for the girls with a score of 4.2. Thanks to everyone who took the time to list outstanding players they saw this weekend. The following people received the most votes for the all tournament team from their respective divisions. If a last name is missing and you know it please let me know so I can add it. Players and Parents, I have managed to get the fields opened a little earlier for us, they will now be open no later than 7:15 as opposed to the 7:30 you were told previously. I am asking all Varsity players to be there by 7:30. 2 practices until Tidewater Tuneup lets, bring the intensity to practice, and focus on doing the little things right, 2 hands on every catch, running through the disc, keeping the force, etc. If it rains to the point you can't go outside either day do one of the indoor practices previously listed. The Tidewater Tuneup Seedings and Schedule for the boys and girls divisions are now final and posted on the score reporter. You can check them out at the links below. We will be having a parents meeting related to Tidewater Tuneup on Monday November 15, 2010 at 6pm in Coach Chappells room. We will be discussing what you should expect from the tournament and will have a signup sheet for help needed during the tournament. Please try to make it out if you can. Players tell your parents about the meeting. The practice Chappell was planning on having on Monday November 8, 2010 is cancelled. The Tidewater Tuneup Seedings and schedule for the boys and girls divisions are now posted on the score reporter. These are just tentative at this point and will be finalized around Nov. 15, 2010. Capt's push the team through these practices, I think it is quite clear the intensity I expect in practice at this point, if it isn't there run sprints at the end. Run hard in drills and we don't run sprints. -Layout drill - the one everyone loved last week, make good strike cuts all the way across the man with the disc. There is no practice because there is no school, however I want everyone to go for a run of not less than 2 miles. Chappell is considering having practice for JV if he does anyone that wants to show up to help the new guys work on their throws and play please do so. I will be at practice Thursday. Change of plans we are going to try and practice on Saturday morning, JV and Girls will be out there we should make the effort too. Time will be 10-12 at which point I have to leave if the others stay later you are welcome to do so. We will run some drills and scrimmage on our own if we have numbers and if not we will combine. Sorry about wavering on that at the end of practice Thursday. I'm going to stress again the Saturday Nov. 13, 2010 practice that one is mandatory! 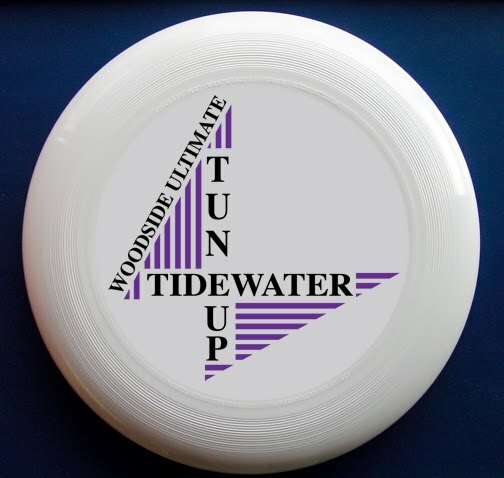 Below is what the Tidewater Tuneup discs will look like. They will be in on Monday if you are interested let myself or Chappell know and we can bring some out to practice, otherwise you will have to wait until Tidewater Tuneup like everyone else to get one. Cost will be $10 each. We are going to have a Saturday practice on November 13, 2010 from 10-1 so try and get the morning off if you need to. This is 1 week before Tuneup so its important for everyone to be there. Scrimmage with Double Score - stress calling all 3 endzones (normal, On the Block, Animal aka Striker [instead of calling striker we will call out an animal, ex. monkey, lion, zebra are all striker]) get the endzone set off turns and try to give time to transition into endzone with handler movement during regular offense. Scrimmage - work on running Symmetry, we didn't run it at all this weekend because we need to work on it more. See the stats from Fall Brawl below, I'm sure you have all been dying to see since the minute you realized we were keeping stats. The Plus/Minus is your ratio of good things (scores, assists, D's) to bad things (turnovers) that you had for the tournament plus is obviously good, but don't be discouraged by being in the minus its not necessarily bad. If you touched the disc 100 times and only had 1 turn but no assists, scores, or D's you'd be in the minus but would have only turned the disc over 1% of the time which is good. Great tournament this weekend guys, we worked hard, learned what we need to work on, and will become a better team for it. Tied for 5th is a solid finish in a high level tournament like Fall Brawl. Be proud of the way we played and your team. Thanks to all the parents involved in making the trip possible this weekend as always it wouldn't have been as successful as it was without you. We apologize for the extremely late return but it was due to unforseen circumstances and we did our best to to get through them the best way possible. Its a learning experience with each new group of kids/parents every year so please know that we will continue to approve and run more smoothly as we move forward. Scrimmage - Run both Offenses (75%-Ho 25%-Vert roughly), Run some Z try to call shatter when needed, some Symmetry, and some normal man, call endzones - Put together everything we have done over the past several practices. Conditioning - Set up T-drill agility drill, and X-drill agility drill, Form a line at the T-drill and run once through T-drill, do 15 burpees, then once through X-drill, then go to the back of the line and repeat, 3 total cycles. Scrimmage - Run everything like Wednesday, work ont he same things. Quick Cuts to Huck - the drill we ran the first day of practice where you make 5 cuts around the rectangle then cut deep. Run 2 so that players get to throw the huck with both throws. Twice through each side. Dues must be paid or you must have a payment plan worked out with Coach Chappell by the end of practice Wednesday October 20, 2010 in order to play in the tournament. You must have the medical waiver from Coach Chappell filled out and returned by the end of practice Wednesday October 20, 2010 in order to play in the tournament. You must have the 2 Fall Brawl waivers filled out and returned by the end of practice Wenesday October 20, 2010 in order to play in the tournament. HS Easterns had been announced as May 21-22, 2011 in Kennett Square, PA right outside Philly. If you guys want to be there then keep putting in the work in practice and lets win some games in our upcoming tournaments. 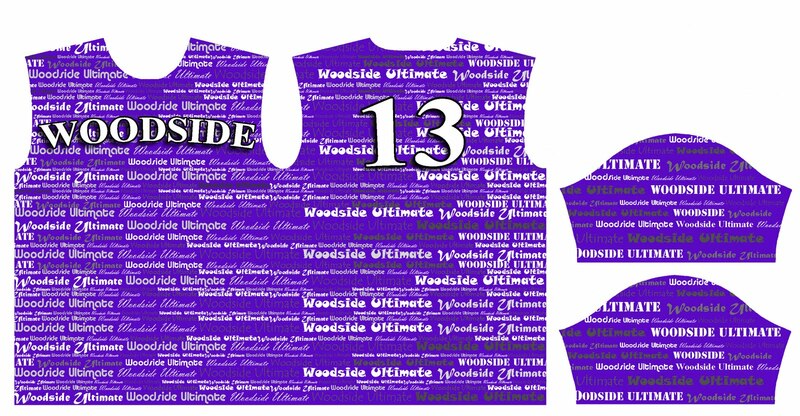 This is a mock up of what the sublimated jersey will look like if we can win the contest VC Ultimate is doing. We will refine it a little before we get them printed but it should give you the general idea. Purple background, "Woodside Ultimate" in lots of different fonts and shades of grey and white, Woodside on the front your number on the back with a drop shadow behind each. In order for us to have a chance you need to go to Facebook and "like" VC Ultimate, then go to the jersey contest and "like" our design. Than get all your friends to do it too. We are a couple weeks and a few hundred votes behind but I'm sure we can make this happen if you get all your friends to do it. Conditioning - Same as Wed.
Let me know if you have any questions otherwise I'll see you on Monday. Don't have time to run and throw? Don't have the 45-60 minutes to get out and do some legitimate running and throwing take about 10 minutes to do this workout. Tue, Wed, Thur (Aug. 31-Sept.2) this week at the CNU track 5:45 if you want to run and throw, or just come talk about the upcoming year while I run. Get the word about the blog out to everyone returning for Varsity or JV that you know and start recruiting new players for the camp and the season. Tidewater Tuneup, Fall Ultimate Camp, and the first practice dates are all set now. Ultimate Camp will be Sept. 18, the first practice will be on Wednesday, Sept. 22 with a Saturday practice that week on Sept. 25, and Tidewater Tuneup is set for Nov. 20-21. If you have a job plan ahead for the 18 and 25 now so you can be there these two dates are important. If you have a job plan ahead and take off the 18th and the morning of the 25th. We are 3 weeks out from practice you should be doing some running and throwing on your own to get ready by this point. If you are interested you can come out to the CNU track/practice fields on Satuday Aug. 29 for a little running and throwing. We are a little over a month out from the start of school and practice. Hopefully everyone will be getting the link to the website and checking out whats going on with Woodside Ultimate for the fall. Please look through the site and let me know (rrudnic@gmail.com) anything you think could be added to make the site better and more useful.The purpose of this post is to talk about some changes for this year and to let you know what I would like you to be doing over the next month to get ready for practice. We will be running less in practice and incorporating more drills and situational scrimmaging. I believe we can be in excellent shape capable of running with any team we play by running the drills and scrimmages hard. I expect that you to give 100% during drills and scrimmaging. You will be accountable for being late or missing practice without a legitimate excuse. You will also be accountable for having the proper attire, cleats, etc. We have limited time to practice and we need to make the most of it. Not coming or being unprepared isn't acceptable anymore. We will look into having some indoor practices when the weather is poor in late fall and winter. We will be trying to set up some scrimmages with LC Bird during periods when we don't have tournaments. There is just over a month until the first practice (see Ultimate Calendar) and I'm sure most of you haven't been playing, running, or done much of anything for Ultimate since May. I would like everyone to try to run twice a week leading up to practice in order to get back into shape and give us a good starting point. I have posted several track workouts, you should try to run one of them on 1 of your days and a different one or a distance run (3 miles) on the other day. You should also try and throw a couple times a week leading up to practice. Get together with a couple of the other players and run together and throw afterwards or go on your own but get back into Ultimate. You can also come run with me at Christopher Newport University if you want, I normally go on Monday and Thursday, email me if you are interested. I would also recommend everyone start Air Alert as soon as possible and try to stick to the schedule through the completion. This year is going to be a lot different than last year but our goal is the same to Win States and get a bid to Easterns. So get ready for a fun year with a lot of great Ultimate, and go for a run. If you aren't sure what prisoner squats or saigon squats are do a google search, you'll find video, description, etc. 12 x 200's is a workout designed for 2 people on an indoor track (indoor tracks are 200m). The first person will run 1 lap hard and when completing 1 full lap the second player will go while the first rests, another option would be 100m out and back like the straighaway on a standard track. 12 reps per person of 200 meters with a rest between each rep. This can be modified to be done with 3 players on a standard (400m) outdoor track with 1 player on each side of the track in the rest cycle while 1 player is running, however this results in a rest period twice as long. I would recommend increasing the number of reps (18-24) if this format is used. 20 meter sprints, jog back, 2 sets of 5 reps, 3 min rest between sets. This is a ladder sprint workout which should be done once a week and lasts 13 weeks.